We have shown earlier that decaying two-dimensional (2D) turbulence in the presence of mean shear exhibits a species of turbulent spectra that has never before been observed or predicted theoretically: the Janus spectra. Here, the streamwise and transverse fluctuations behave as two mutually-independent turbulent fields of disparate dynamics that are concurrently active within the flow. Their attendant spectral exponents, surprisingly, are the same as the isotropic ones from the classical 2D turbulent cascades. Using soap-film experiments, we established that the Janus spectra is a robust phenomenon -- it can be realized for a wide range of forcing conditions. 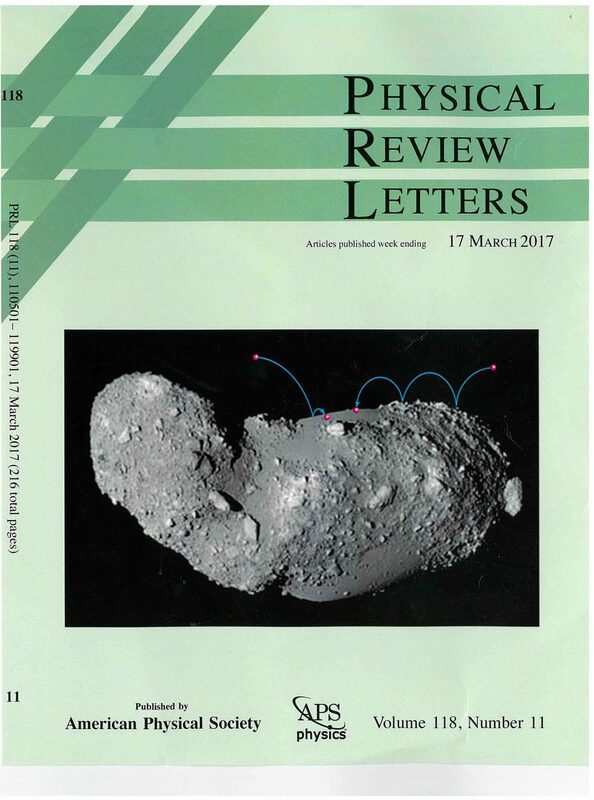 In research carried out in FY2015, we proposed that the unexpected size segregation seen on the asteroid Itokawa, where regions populated almost entirely by small pebbles are separated in space from regions consisting only of larger boulders, is caused by the novel mechanism of ballistic segregation. Our experiments and simulations demonstrating this phenomenon were conducted under Earth's gravity. We conducted simulations of ballistic segregation under Itokawa's gravity -- which is smaller than Earth's gravity by five orders of magnitude -- and showed that the effect of ballistic segregation becomes even more pronounced. Our results suggest that ballistic segregation plays a dominant role in shaping the surfaces of Itokawa and rubble-pile asteroids in general. We have continued experiments and simulations to study how surface topography shapes the ejecta in granular cratering. Our preliminary results suggest that surface topography might be the key to unveiling the mystery of the long-elusive crater ray system -- the set of long, radial, streaks of ejecta that fan out from a crater, like spokes on a wheel. Osborne Reynolds's seminal experiments from 1883 reported three distinct states of flow in a pipe: laminar, turbulent, and a transitional state that lies in between laminar and turbulent states. As a quantitative signature of the flow states, Reynolds measured the flow friction, f, as a function of the dimensionless flow velocity (now known as the Reynolds number, Re). The f vs. Re diagram acts as a state diagram: the different states of flow occupy distinct regions in the diagram. Using experiments and direct numerical simulations, we study the f vs. Re behavior for the transitional state which has remained perplexing ever since Reynolds's work. Our preliminary results suggest that the conventional measure of f in the transitional state is misleading as it averages the values over two distinct states: the laminar and turbulent states. We have continued development of the OIST Taylor-Couette experiment. We have coupled the experimental setup with a chiller unit that is located outside the building. The purpose of this chiller is to cool the working fluid in the setup. This is done via a coolant fluid that circulates between the chiller and the top and bottom plates of the Taylor-Couette cylinders. To monitor the temperature of the working fluid, we have installed many resistance thermometers inside the inner cylinder (in all three sections). We have also designed and procured rough inner cylinders with geometrically-similar roughness which are spread over a hexagonal lattice. C-C. Liu, R. Cerbus, and P. Chakraborty. 2016. Janus spectra in two-dimensional flows. Physical Review Letters, vol. 117, article 114502. Shinbrot, T., Sabuwala, T., Siu, M., Chakraborty, P. 2017. Size Sorting on the Rubble-Pile Asteroid Itokawa. 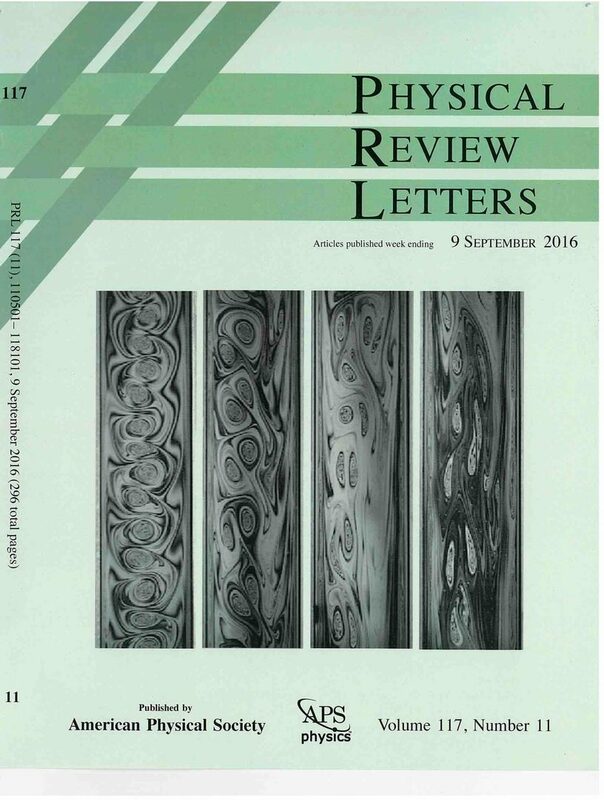 Physical Review Letters, vol. 118, PP.111101, DOI10.1103/PhysRevLett.118.111101. Cerbus, R., Liu, C., Sakakibara, J., Gioia, G., Chakraborty, P., The mean velocity profile in turbulent slugs, RIMS International Project Research 2016, Fluid Dynamics of Near-Wall Turbulence, Kyoto, Japan, June 21 (2016). Zhang, D., Gioia, G., Chakraborty, P., Macroscopic non-universality in turbulent plane-Couette flows, RIMS International Project Research 2016, Fluid Dynamics of Near-Wall Turbulence, Kyoto, Japan, June 21 (2016). Zhang, D., Gioia, G., Chakraborty, P., Spectral link for the mean velocity profile in the atmospheric boundary layer, 69th Annual Meeting of the APS Division of Fluid Dynamics, Portland, Oregon, USA, November 21 (2016). Cerbus, R., Liu, C., Gioia, G., Chakraborty, P., Turbulence in Reynolds' flashes, 69th Annual Meeting of the APS Division of Fluid Dynamics, Portland, Oregon, USA, November 22 (2016). Cerbus, R., Liu, C., Chakraborty, P., Janus spectra: cascades without local isotropy, 69th Annual Meeting of the APS Division of Fluid Dynamics, Portland, Oregon, USA, November 22 (2016). Cerbus, R., Liu, C., Sakakibara, J., Gioia, G., Chakraborty, P., Energy cascade in transitional pipe flows, Dynamics Days Asia-Pacific (DDAP), Hongkong, December 17 (2016).